The treated wastewater is normally lead to the discharge area of the receiving environment at a certain depth and distance from the coast. An output of deep water provide excellent dilution of wastewater. The depth will vary output in a range of 10-60 m, depending on the self-purification capacity of the receiving environment. The receiver means may be a river, lake or sea. The emissary usually starts in the discharge chamber of the coastal zone, to where the wastewater is lead by gravity or pumping. It is unusual to resort to pumping directly into the outlet pipe and is not recommended. If necessary pump, the best solution is to pump wastewater to the discharge chamber and lead by gravity to the receiving environment. The main task of the discharge chamber is to prevent air from entering the pipe. The air can cause flotation of the pipe due to the pushing force. It should also take into account the variations of the high and low tides when the discharge chamber is designed. The implementation of a proposed outfall must be preceded by a search base information through extensive oceanographic tasks duration and extent. These tasks include the biological, physical, geological, chemical and meteorological areas, to obtain data on winds, ocean currents, waves, tides, bathymetry and nature of the seabed. Knowledge of the nature of the seabed is one of the most important aspects with regard to pipes in a trench, directly resting on the seabed or a composite of the two previous, generally the more usual solution. 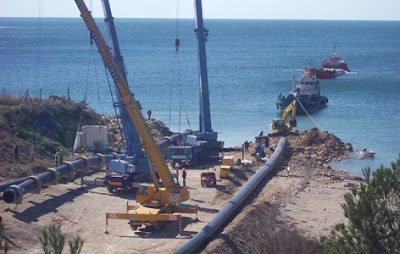 The main forces at work in underwater pipelines are those resulting from waves and sea currents. Pipes installed along the edges or river crossings, suffer the effect of currents. In the case of an outfall in addition to the effects of waves and sea currents, also we must take into account the forces resulting from the instability of funds. The evaluation of the different active forces is particularly difficult and often lax. Resistance in the surf zone. Resistance of the instability of the seabed. Definition of the length of the section, according to the features of implementation. Ability of the mechanical joints to connect the various sections and maintain structural continuity of the emissary in the longitudinal direction. Ability of adapt "ballast" according to the depth and characteristics of the seabed. Definition of flows and speeds. Layout and calculation of hydraulic components. The biological component in oceanographic studies are divided into different parts. One is to determine the parameter T 90 (bacterial decay), based on which - taking into account the effects of currents, waves and winds - the length of a sewage outfall is calculated. Knowledge of the profiles of temperature and salinity at the point of discharge/outlet. Coefficient of dispersion and self-purification. Capacity of the receiving environment, among others, to allow to define the leght of the outfall and diffuser features. They can be of different shapes, according to the type of installation, use eccentric weights is recommended to ensure greater stability of the pipe. As PE pipes float even full of water, to sink should be incorporated ballast concrete generally consisting of two pieces of reinforced concrete, with dimensions and different shapes, and that are wrapped around the pipe by bolts and nuts. Inside part normally they have two synthetic rubbers EPDM type to prevent damage to the ballast concrete pipes. Protection of the metal elements and the flanges for connecting pipe sections is guaranteed with sacrificial anodes in principle zinc or aluminum. The weights should be arranged with equidistant intervals - no more than 10 times the nominal diameter of the pipe, not exceeding 5 meters - for low slenderness ratios are achieved. By "cargo" you can be defined as the ratio, represented as a percentage, the sum of all loads and forces sinking thrust system, considering the pipe filled with air. During the operation of sinking the pipe must not be charged more than 65% of the buoyancy, decreasing this percentage depending on the characteristics of the tube (thickness) and the depth of the sea. The cement used in the concrete must resist the chemical aggressiveness of the water and the steel used must be coated with a minimum of 40 mm. The contact surface of ballasts with tubes must be coated with elastomer strips EPDM or Neoprene 5 to 10 mm minimum thickness. The lower and upper ballast are attached with screws galvanized steel and protected with sacrificial anodes. 0 Response to "Construction of Pipelines Outfalls With Polyethylene"